Posted 24 October 2014 & filed under Early 20th century, People, Places and spaces, Streets, Work. Longmire Road was the first road to be built on the Priory Park estate. It was certainly occupied in 1900 and it appears in St Albans Street Directory in 1901 and the census. It is believed that Longmire Road is named after William Longmire, a builder and contractor who lived in Prospect Road in the late 19th century. 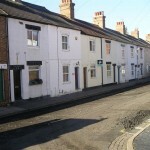 The houses were all originally rented out and were workers cottages. 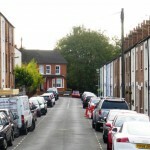 The original numbering of the houses in Longmire Road ran from no.1 on the southwest corner of the cul-de-sac to no. 28 and then from 29 on the northwest corner to no. 42. Beyond the cul-de-sac the medieval road continued as a footpath up to Sopwell Lane. At the bottom of the cul-de-sac was a large house, built in 1901 by the Bennett’s, called Trelabe. Later it was called the Dell. It was removed for Riverside Close to be built in about 1960, but by that time it was in ruins. Houses on the south side had mainly four rooms but those on the other side of the road had five rooms. Longmire Road became Riverside Road in 1970. Here are the families that lived in the road as described in the 1911 census. Some numbers are missing. At numbers 1 and 2 lived Frank Schraivogel. He had a wife and two children. He and his wife were born in Germany. He worked as a hand launderer. His son, Roman was a Caddy boy on the golf links. 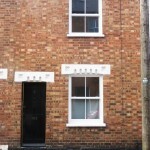 Charles March plus wife and daughter lived at number 3 and he was a Plasterer labourer. At number 4 lived Herbert Gentle with his wife and four children. He was a brushmaker and the foreman in the factory. Joseph Hardy plus wife and seven children lived at number 6. He was a Jobbing gardener His son Hugh was described as a Laster in the boot manufacturing industry: his daughter Elizabeth was a Silk winder in the Silk Mill; and son William was a School House errand boy. At number 8 lived John Mills, a House painter, plus wife and two children. 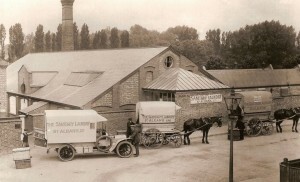 Wife Emma and daughter Mildred were a laundry assistants. At number 11 was Benjamin Smith a Bricklayer with his wife and six children. His son Leonhard was a Grocer’s errand boy. John Fowler plus wife and six children lived at 13 Longmire Road. He was a General Labourer in the building trade. Two of the children, Mabel and John, were Boot machinists. Robert Stell lived at number 15. He was a Carman. In the same house lived Jessie Frossdyke with her daughter. She was his housekeeper. At number 16 was John Shadbolt with his wife and two children. He was a Railway Plate layer. George Clare, at number 17 was a general Labourer – a gravel digger on the estate. He had a wife and family. Living with them as a boarder was Henry Pope, a Carman. At number 18 was William Martindale, a Carter for General contractors. His wife, Teresa, was a Packer and Sorter in the Sanitary Laundry. This was presumably the one on Belmont Hill. Samuel Blunden plus wife and three children lived at number 20. He was a Motor tyre maker. Joshua White plus wife and daughter lived at number 21. He was a Coal porter. At number 22 was Frederick Warner plus a wife and two sons. He was a Foreman platelayer. At number 23 William Dimmock was a Kennel man for sheep show dogs. He lived with his wife and 6 children. Henry Lawrence plus wife and seven children lived at 24. He was a jobbing Gardener. At number 25 was Ernest Taylor with his wife and son. He was a Motor car tyre repairer for a Rubber manufacturer. At number 26 Ernest Smith plus wife and child describes himself as a Rubber worker in the Motor Tyre industry. Walter Dunham in number 27 was a General Labourer in a Timber Merchants. He had a wife and three children. Arthur Bassett, a Builder’s labourer lived at number 29. He had a wife and six children. His 14 year old daughter, Maud, was a domestic servant. At number 30 was Charles Cooper and his wife. He described himself as a Cook on buildings. At number 31, Alfred Catlin plus wife and eight children was a Bricklayer’s labourer. His son John was a Moulder in the rubber industry, another son, Albert, was a Grocer’s errand boy and Earnest was a Shoe turner in boot manufacturing. At 32 lived Thomas Hough with his wife and five children and his wife’s father. He was a General Labourer. His daughter, Edie, was a French polisher in a brush factory, another daughter, Florence, was a Shirt collar machinist in the laundry, and his son Thomas was a Dyer’s labourer. The father-in-law, John Toms was a General labourer. Frederick Lee lived at number 33 with his wife and eight children. He was a Tinsmith. His daughter Lilian was a Domestic servant and two of his sons described themselves as Piano workers. At number 34 was Henry Lowe with his wife and six children. He worked for the Midland Railway as a Facing point cleaner His son, Harry, was a Painter’s labourer, his daughter, Agnes, was a Laundry hand and his son Joseph worked in the Silk Mill. Frederick Dorling, a widower with six children lived at number 36. He had a housekeeper named Emma Living. He was a Shoemaker’s pressman. His daughter Emma was a Machinist and his son Robert was a Newsboy. At number 37, lived George Golding a Plasterer’s labourer, with a wife and five children. Living with them was Anne Hathaway, a widow, with her daughter Ada Cardell who worked as a Charwoman. George’s Son William was a Milkman, another son, George, was a Brush finisher, his daughter Annie was a Brush maker, and another daughter, Fanny, was a Boot dresser. At number 38 John Slough lived with his wife and seven children, He was a Jobbing gardener. Thomas Bennett plus wife and five children lived in the big house called Trelabe. He described himself as a General dealer working for himself. Son Jacob was a clerk in the rubber tyre factory and son David was a clerk in the telephone company. Fantastic info on Longmire Road, I did mention in a earlier comment that I remembered as a child the ‘Schrogels’ shop at No. 1, and I had completely forgotten the big house by the pathway to St Peters school. Now remember it as a bit of a mysterious place. Also it lists in the details that Mr Dunham lived at 27; we lived at 26 and I believe I mentioned Mr and Mrs Dunham as our neighbours with the cellar full of vegetables. Also that Mrs Dunham was our local ‘nurse’, I well remember her applying dressings to my knee for a couple of weeks until it healed. Wonderful memories.